Sorrel is a wonderfully versatile and delicate herb that is well worth the trouble of preparing it. Sorrel soup is traditional throughout Eastern Europe and makes a perfect dish for Lent. One of the reasons I love living in Russia is the year-round access to sorrel. This delicate leafy green is a rare treat in Europe and the U.S., where its brief, late-spring appearance is treated like a “one-night only” performance by a legendary diva. In Russia, however, even in the depths of winter, it only takes a quick trip to the farmers’ market to score as much sorrel as you need to make a fantastic sauce for meat or fish (sorrel and salmon are a match made in heaven, as are chicken breasts and sorrel) or a classic Russian green borscht or Shchavelya soup. I assume there is a massive, top-secret sorrel bunker just south of Baku; I don’t care how nefarious it is, however, as long as they continue to satisfy my regular cravings. Sorrel soup is a pale green thread that runs through the cuisines of Eastern Europe. The Poles serve it cold, garnished with hardboiled eggs and sour cream. Ukrainian green borscht combines sorrel with potatoes, carrots, and other root vegetables for a clear soup, which is served hot. A Czech version I encountered in the United States marries apples and sorrel for a very distinctive flavor that is at once sweet and piquant. The French version of sorrel soup takes it to a whole new level: a velvety puree, thickened with eggs and cream, both of which perfectly compliment the indulgent tangy, slightly peppery flavor that sorrel leaves take on when they are cooked down. There are only two drawbacks to working with sorrel. Once picked, there is a short window of opportunity to use it before it wilts. Then there is the fiddly problem of having to remove the stem from each leaf, which can be time-consuming and a bit nitpicking, but is essential: Sorrel stems are extremely bitter and will ruin the flavor of your soup or sauce. As Russian Orthodox Christians are still adhering to the Lenten fast, eschewing all dairy products, eggs, meat, fish, alcohol, and sugar, another culinary challenge emerges: How to make a great-tasting sorrel soup that stands up to the classics without relying on the props of butter, eggs, and cream. After a few batches, I finally found the right balance of textures and flavors. Curiously, potatoes, on which I assumed I could rely for their starchy, thickening properties, made the soup far too stodgy; zucchini proved a much better substitution. Celery root provided a nice boost to the tart flavor of the sorrel, and slowly caramelized leeks with nutmeg made a wonderful base and the velvety texture I was aiming for. Finally, sorrel’s perennial ally, spinach, greatly enhanced the color, texture, and flavor of the soup. While nothing can replace the alchemy that happens when sorrel leaves are slowly sautéed in butter, cooking them down in a few tablespoons of water did bring out their crucial flavor. A little salt, a squeeze of lemon juice and a pinch of cayenne pepper did the rest! 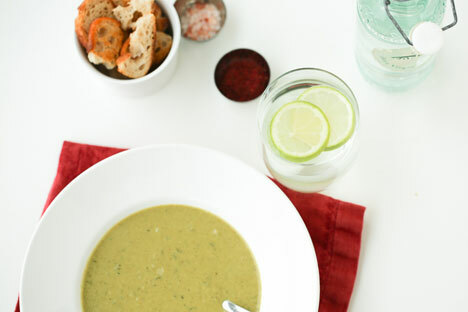 For a non-Lenten version of this soup, use chicken stock instead of vegetable stock, sauté the sorrel and spinach leaves in 4 tbsp of butter, and add 2 tsps of sugar to the leeks as they reach the midway point of “sweating.” Puree the soup in a blender or food processor fitted with a steel blade, then slowly pour one cup of the hot, pureed soup into 2 egg yolks, beaten until creamy. Add a dollop of sour or heavy cream at the end! In a deep, heavy-bottomed stockpot, bring 1/2 cup of water to a simmer. Sauté the leeks in the water until they are soft, sprinkling 1 tbsp of salt and 1 tbsp of nutmeg over them as they begin to wilt . Add the celery root, zucchini, and stock, bring to a boil, then cover and let simmer until the vegetables are soft when pieced with a fork. INFOGRAPHICS: What can you eat during the Great Fast? Set a large sauté or frying pan over medium heat, then add 4 tbsp of water and bring to a slow simmer. Add the sorrel leaves and cook down until the leaves have wilted and leached out all of their water. Add the cooked sorrel to the stockpot, stir to combine and cook for 3 minutes more. Then add the uncooked spinach and parsley, and the remainder of the salt and nutmeg, and cayenne pepper if you wish. Remove from heat and add the lemon juice. Process the soup in batches in a blender or food processor fitted with a steel blade to your desired consistency.